The College Completion Innovation Fund is the first collaborative fund focused exclusively on college retention and completion in New York City. This report details the development of the fund, grants awarded, benefits for funders as well as benefits to the field. 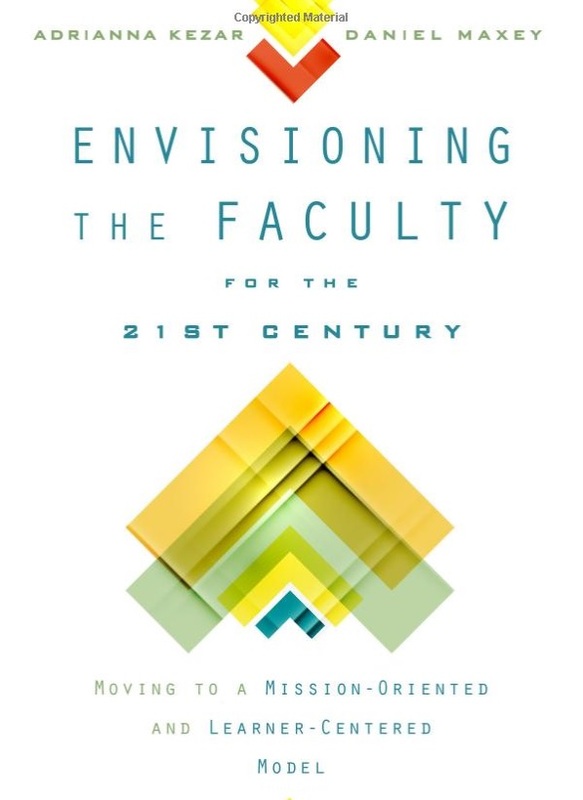 This book chapter by Richard Gilman, Nancy Hensel, and David Salomon outlines an approach to the faculty reward system that recognizes the totality of faculty work encompassing teaching, advising, research, and service while managing faculty workload in a manner that better supports student learning. 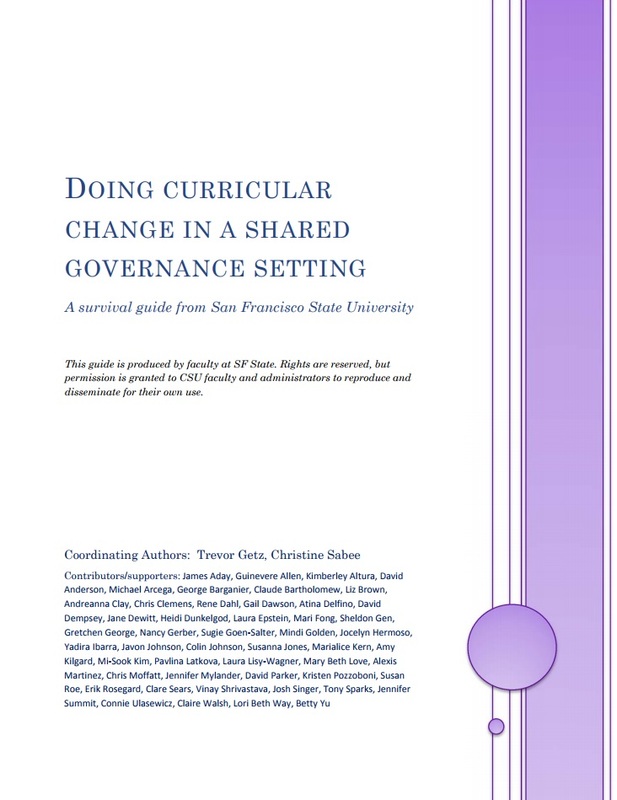 This “survival guide” was developed by faculty from over a dozen departments and across four colleges at San Francisco State University based on their experience with redesigning majors in a shared governance setting. 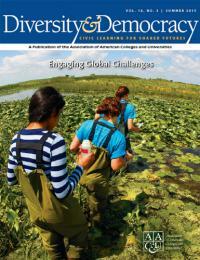 Based on his evaluation of the Teagle Foundation’s A Larger Vision for Student Learning initiative, William Sullivan shares lessons learned on deepening students’ sense of civic responsibility and strategies to support faculty and staff commitment to these ends in Change Magazine. This report provides information about the evidence needed to understand program impacts, as well as tips from prior Preparing Future Faculty (PFF) programs for collecting and analyzing data for program evaluation. 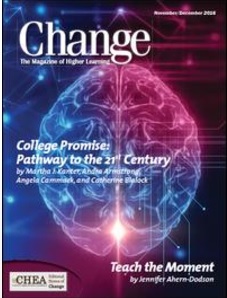 Based on the evaluation of the Teagle Foundation's Hybrid Learning and the Residential Liberal Arts Experience, program director Loni Bordoloi Pazich and external evaluators Martin Kurzweil and Daniel Rossman of Ithaka S+R distill key findings in this Change Magazine article. 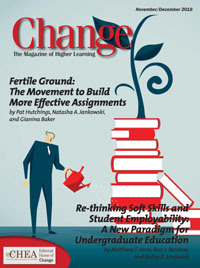 In fall 2013 The Teagle Foundation issued an RFP inviting selected institutions and organizations to apply for grants that addressed the following question: “How can faculty work together to create a more coherent and intentional curriculum whose goals, pathways, and outcomes are clear to students and other constituencies with a stake in the future of higher education?” This essay is based on an evaluation of four of the early grants in this initiative. Executive director of Books@Work Ann Kowal Smith was invited to co-author an edition of the New York Times series "Text to Text." 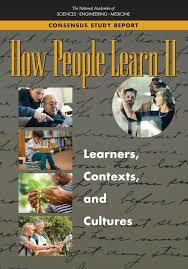 How People Learn II: Learners, Contexts, and Cultures expands on the foundation laid out in the influential 2000 report published by the National Academy of Sciences and takes an in-depth look at the constellation of influences that affect individual learning. 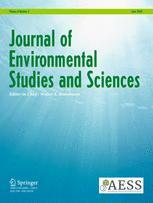 The authors assessed the change in critical thinking skills with a sample of 176 students enrolled at either the University of Colorado Boulder (UCB) or Colorado College (CC) by employing the Critical-thinking Assessment Test (CAT) developed with collaboration and support from the National Science Foundation. 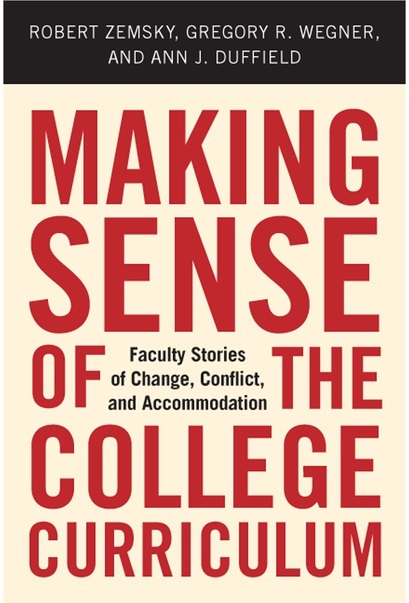 Faculty members representing all sectors of higher education, share personal, humorous, powerful, and poignant stories about their experiences in a life that is more a calling than a profession. This Chronicle of Higher Education spotlight features the work of New York Six consortium members participating in two different Teagle Foundation grants. In “Refining the Paradigm,” the authors address the issues found in current models of faculty evaluation and provide ideas for supporting faculty development and taking a holistic approach to evaluation. In this special report from The Chronicle of Higher Education, reporter Beth McMurtie describes findings from the external evaluation of Teagle's Hybrid Learning and the Residential Liberal Arts Experience conducted by Ithaka S+R. The signature activity of the Council of Independent Colleges’ initiative, Securing America’s Future, was a series of eight workshops hosted by CIC member presidents on campuses across the nation in 2016–2017. 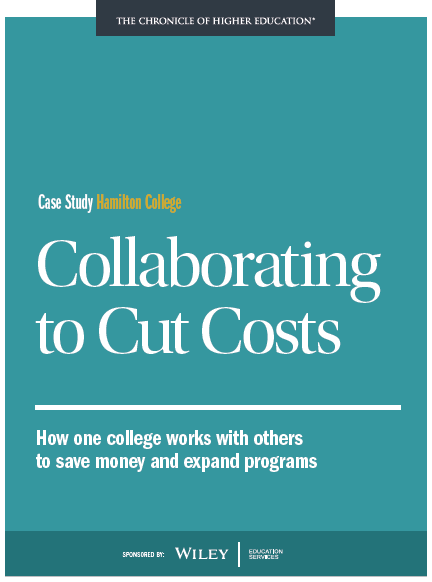 This report presents an overview of the major points of discussion and references examples of innovations shared by the colleges and universities that attended the workshops. 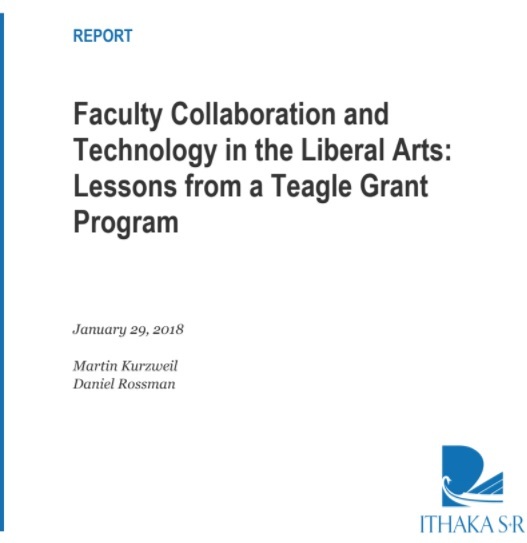 The Teagle Foundation partnered with Ithaka S&R, a not-for-profit research group, to gather lessons learned across funded projects under its "Hybrid Learning & the Residential Liberal Arts Experience" initiative. Surveys suggest that a majority of graduate students seek academic positions after completing their degree. The authors survey groups involved in the job market to determine the roles of teaching and research in hiring and the subsequent success of new faculty. 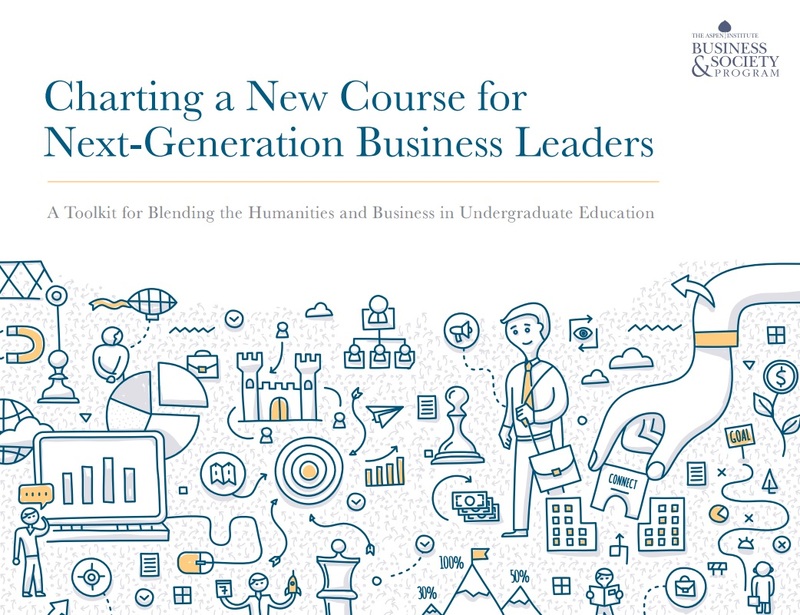 This electronic “binder” brings together resources contributed by graduate students, faculty, and staff on teaching effectively in history and preparing a teaching portfolio for the academic job market. 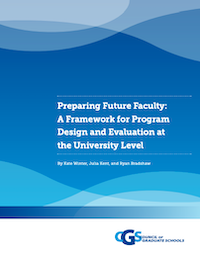 The Council of Graduate Schools’ Preparing Future Faculty to Assess Student Learning initiative was a three-year project to identify models for infusing undergraduate learning assessment skills into existing Preparing Future Faculty (PFF) programs. What are the elements that leaders that should keep in mind when pushing for change that sticks? This handout serves as a discussion and planning tool for teams. In common practice the term collaboration serves as a handy label to mark and acknowledge working relationships between individuals, departments, or organizations. This handout serves as a discussion and planning tool for leaders of projects that involve multiple entities and is especially relevant for higher education consortia. Building upon AGB’s study published in 2016, “Shared Governance: Is OK Good Enough?” this report provides qualitative information on the state of shared governance. 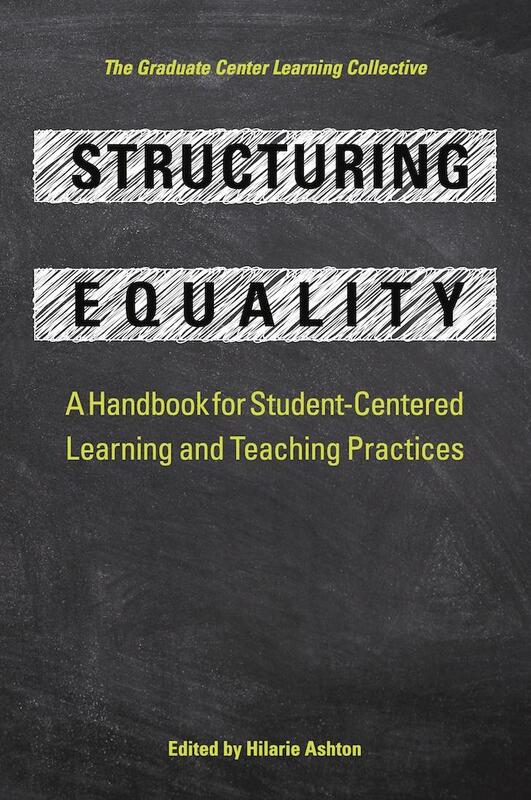 The basic premise of student-centered, engaged learning is that, to make a truly equitable and democratic society, we have to begin with a form of instruction that is itself equitable. 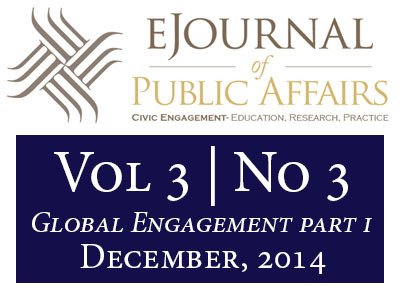 The Teagle Foundation-funded Creating Cohesive Paths to Civic Engagement (2013-2016) spurred Periclean member institutions to inventory, map, and strengthen civic engagement across the curriculum. This white paper documents the process and how it can serve as a powerful catalyst for change on campuses. Based on her evaluation of the Teagle Foundation's Faculty Work and Student Learning in the 21st Century initiative, Adrianna Kezar distills practical strategies consortial and other higher education leaders should keep in mind when scaling and sustaining change efforts. 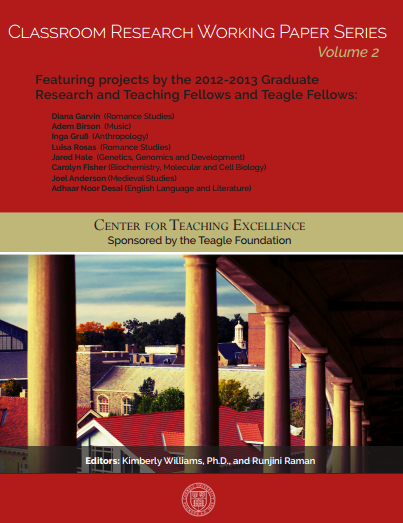 The Teagle Foundation’s Graduate Student Teaching in the Arts and Sciences (GSTAS) initiative, first piloted in 2010 and expanded in 2012, engaged hundreds of graduate students, faculty, staff, and senior administrators across eight elite universities and two professional associations in thinking deeply about undergraduate teaching and learning. This white paper describes findings and lessons learned from site visits to seven GSTAS grantees. 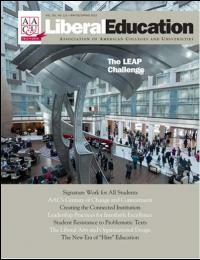 This peer-reviewed article lays out a framework to assess student learning, particularly for “externally-facing” assignments – assignments that connect coursework to “real world” community or public policy issues, and harness the data to promote institutional recruitment, improvement, and accountability. This video features a faculty workshop that highlights strategies for integrating undergraduate research, scholarship, and creative activity into faculty workload through case studies. 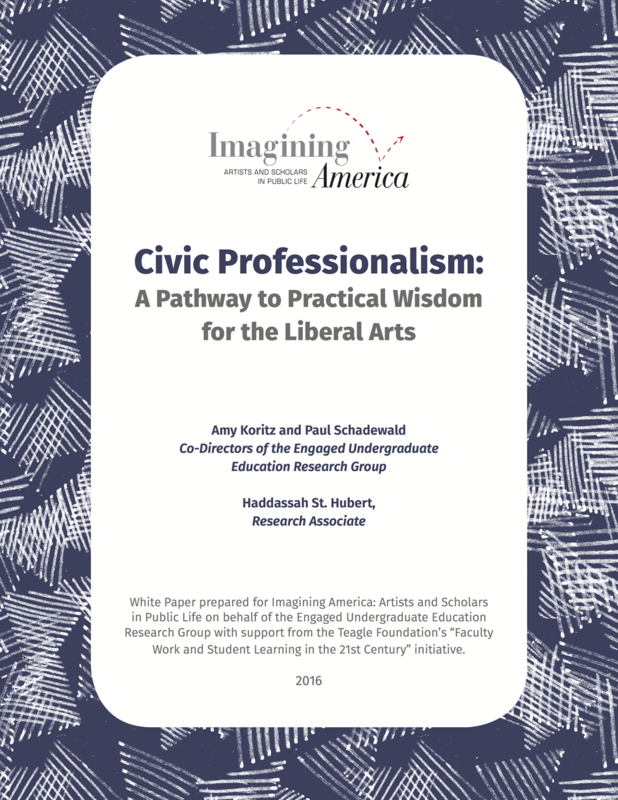 A research group made up of teams from six higher education institutions, under the aegis of Imagining America: Artists and Scholars in Public Life and with funding from the Teagle Foundation, has explored the relationship of civic engagement to the development of professional skills and vocational pathways within the context and values of the liberal arts. Practice for Life builds a compelling case that a liberal arts education offers students a complex, valuable process of self-creation, one that begins in college but continues far beyond graduation. 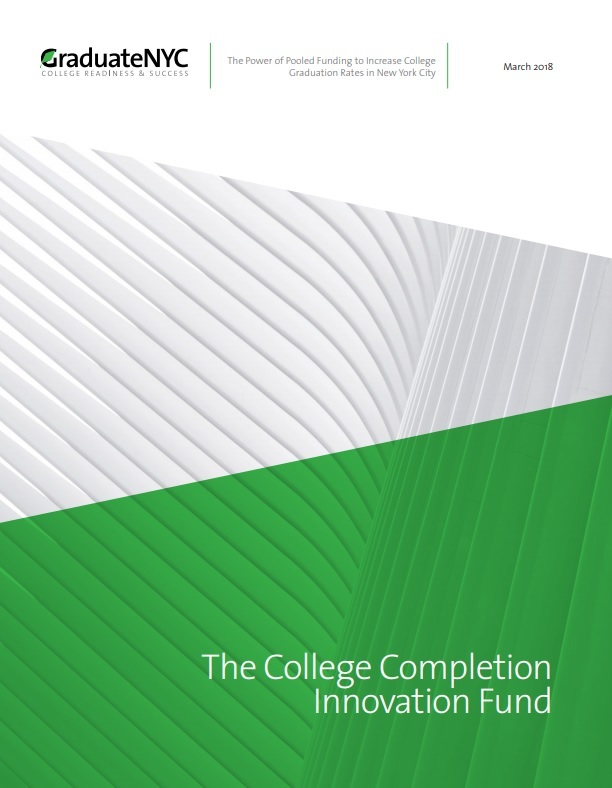 Based on a national, multidisciplinary effort to define and measure learning outcomes—the Measuring College Learning project—this book identifies 'essential concepts and competencies' for six disciplines. Laura Westhoff (University of Missouri St. Louis) discusses how her early interest in teaching and her research on the social construction of knowledge helped lead her to work in the scholarship of teaching and learning within the history discipline. How can historians use the scholarship of teaching and learning to bridge the gap between what historians do and what students learn? In this article, we outline a project designed to foster diversity at Queensborough Community College (QCC) of the City University of New York. This article provides an evaluation of the redesign of a research methods course intended to enhance students’ learning for understanding and transfer. 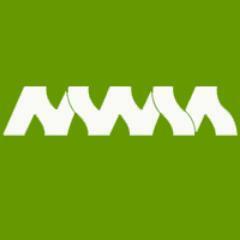 This website showcases creations, collaborations, and contributions from the community of six community colleges. 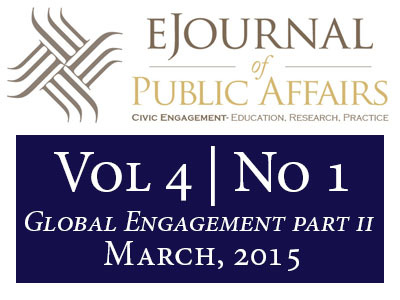 How do we know when an initiative is ready to pursue a rigorous evaluation? More and more funders, policymakers, and program leaders recognize the value of high-quality evidence. Enrolling a diverse student body, hiring a diverse group of faculty and staff members—these are necessary steps toward the goal of building diverse communities, but too often they are seen as ends in themselves. Board members must come to understand the importance of student engagement and how institutions under their leadership can use it to improve educational quality. In this exploratory social network study, we examined how student relationships evolved during three month-long Reacting to the Past (RTTP) role-playing games in a lower division honors course at a large US public university. 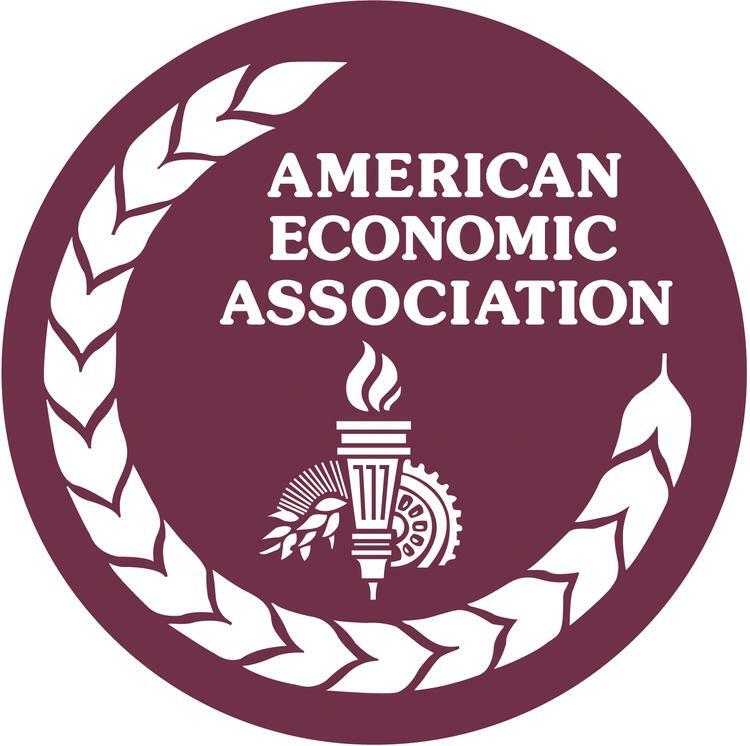 The American Historical Association formed a committee in the spring of 2014 with the charge of analyzing how working conditions for contingent history faculty affect educational quality in the classroom as well as quality of life. 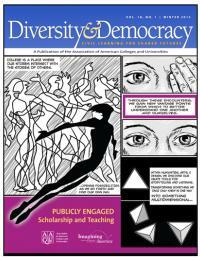 In this issue of Diversity & Democracy, David Hoffman, Craig Berger, and Beverly Bickel from the University of Maryland, Baltimore County (UMBC) point to what they call "the visionary's dilemma." They ask: "How can a movement gain traction when the dominant culture's theories, knowledge, politics, and conventional mechanisms for social and institutional change reflect the status quo?" 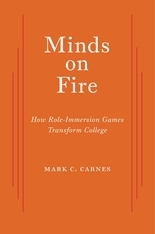 This set of case studies, prepared by Sheila Tobias and published by the American Society of Engineering Education, illustrates how campuses can provide liberal arts students with “technological literacy” grounded in the discipline of engineering while providing engineering students with a better sense of the social, cultural, and political context for problem-solving in engineering. This white paper offers conceptual and practical tools to help collaborators and their collaborations succeed. 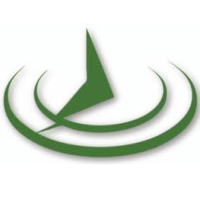 Our goal is to provide practitioners, administrators, assessment professionals, and organizational partners with an integrated framework to help identify and align the people, tools, and processes necessary for collaborative efforts. 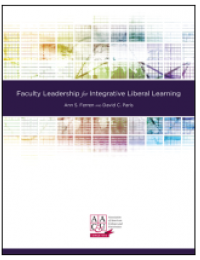 The publication aims to elucidate the value and use of integrative liberal learning and the best pedagogical and faculty leadership practices to prepare students for applying their learning to complex challenges in life, career, and citizenship. By assessing changes in student learning, the article investigates, identifies and isolates specific and transferable classroom interventions for improving student learning and proposes using metacognitive-based teaching strategies in a political science classroom. To address these challenges and improve student learning, a faculty-student team integrated a coral reef living laboratory into a Politics of Sustainability course which focuses on Global Environmental Politics. This article provides empirical evidence of improved student learning outcomes by using pre/post assessment tools, student surveys, and faculty journals. The processes of learning and creating jazz provide a way to illustrate new teaching methods that allow students to discover new knowledge through their own creative interests and to develop self-efficacy with the material. 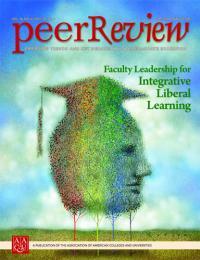 This issue of Peer Review, sponsored by the Teagle and Mellon foundations, offers insights about the central role of faculty in galvanizing the necessary experiences that cross disciplines, units, and campus boundaries to promote integrative learning. 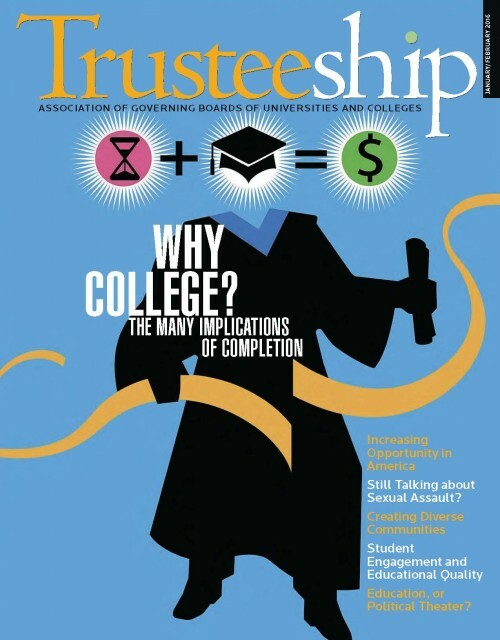 With the national conversation about college emphasizing timely degree completion and readiness for employment, how can community college educators prepare our students to tackle the big questions they currently experience and will further confront in the complex, changing environment of our interconnected global future? 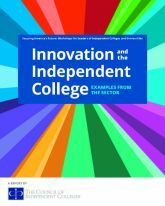 The Lehigh Valley Association of Independent Colleges (LVAIC) developed a “technology cookbook” to provide faculty members with “recipes” on incorporating digital tools in their classroom. Authentic student achievements that are addressed to a real world audience can lead to richly detailed portfolios of work that add value to degrees and the granting institutions. A guide is provided for implementation of new high-impact practices, including structured assignment creation. 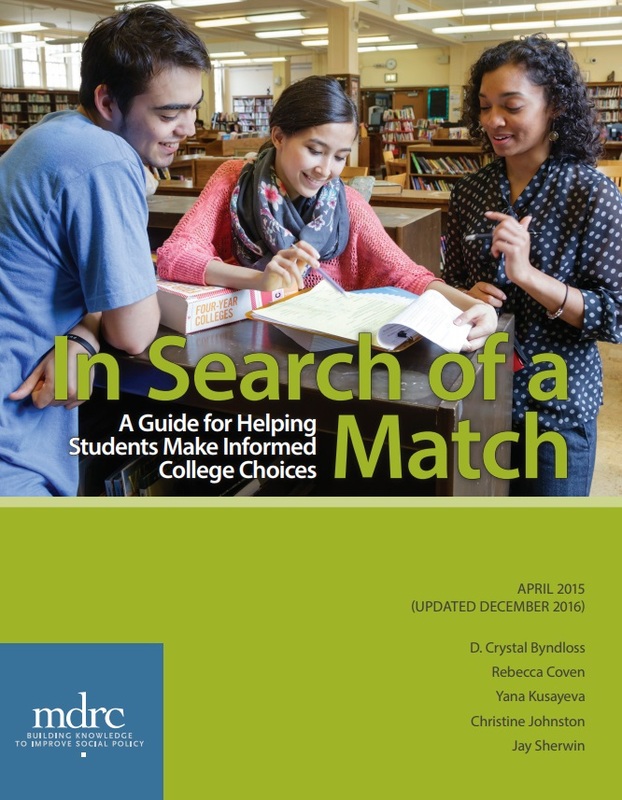 This guide offers strategies for helping students identify, consider, and enroll in “match” colleges — that is, selective colleges that are a good fit for students based on their academic profiles, financial considerations, and personal needs. 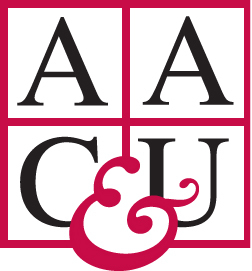 This article describes the work of faculty members and administrators at California State University, Fresno to create courses in the General Education (GE) program taught around the Global Challenges framework developed by members of AASCU’s Global Engagement Initiative. Keynote address by Silvia Bunge at the Teaching Conference for First-Time GSIs, sponsored by the Graduate Division's Graduate Student Instructor Teaching & Resource Center at UC Berkeley, on January 16, 2015. The religious dynamics of higher education are changing rapidly. College campuses have become prime sites for conflicts involving religious identity. 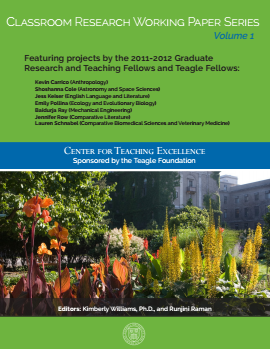 This guide distills key lessons learned about scaling and sustaining innovation from ten projects involved in the Teagle Foundation’s “Faculty Work and Student Learning in the 21st Century” grant initiative. In this report, we describe the process the institutions undertook to become transfer-serving institutions, a process that requires a mindful focus on transfer. 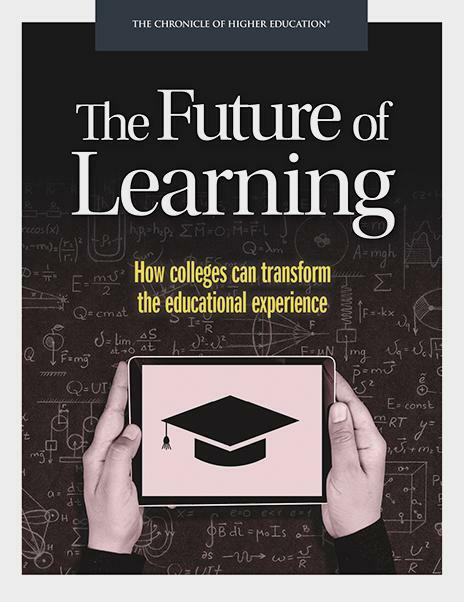 This monograph represents the thinking and conclusions of the participating institutions, which are designed to improve student learning, more accurately reflect faculty work in the 21st century, and continue moving our institutions forward in the age of technology and changing modalities of teaching and learning. This paper explores the effectiveness of the national blended course in meeting its stated learning objectives. In 2013-14, pre/post-tests were conducted on three pilot campuses. 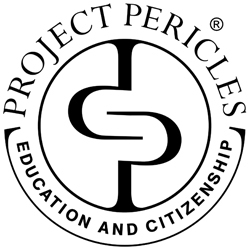 The pre/post-tests indicate that students’ knowledge about global issues and ways to get involved in civic life increased after taking the model course. 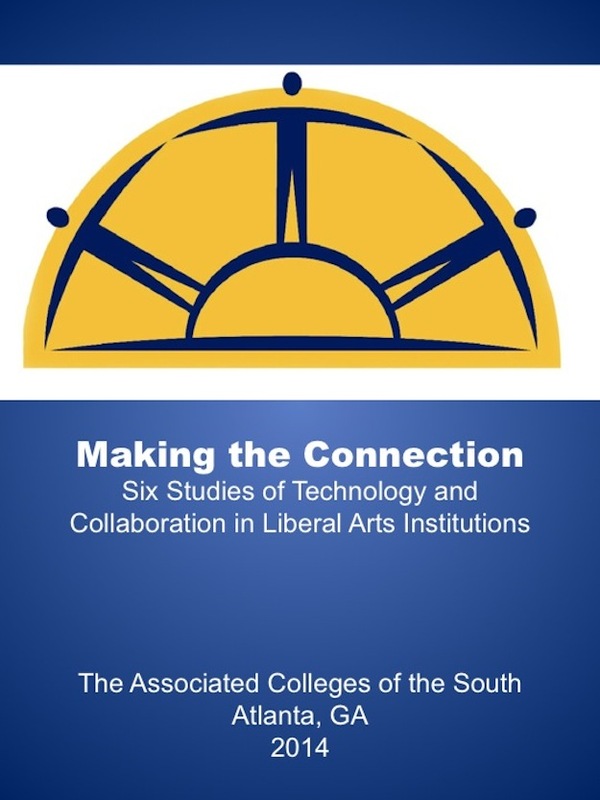 Even as the value of liberal arts institutions has historically been defined by a small, highly interpersonal classroom experience, the consortium pursued a vision in which new technologies would allow liberal arts faculty and staff to forge partnerships with colleagues within and across institutions. 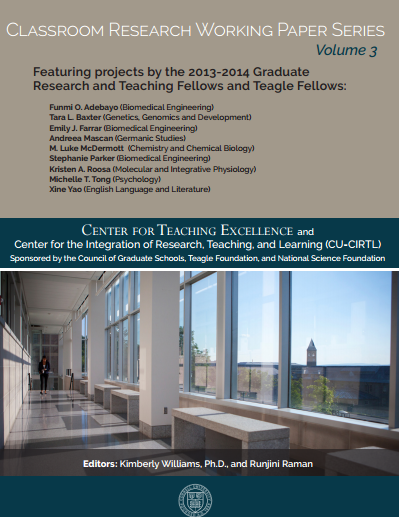 With the support of the Teagle Foundation, COPLAC has probed the viability of distance-mentored undergraduate research, in which students from one institution conduct research under the supervision of expert faculty at another. This article addresses three questions: What do professors need to know about the science of learning to teach most effectively, how can they find out if what they are doing is working, and how can faculty-development efforts best help them apply the knowledge drawn from the research? The “What is a Reader?” project convened a set of scholars and teachers from four university English and literature departments to consider what is happening to our students’ reading in the twenty-first century and to explore how we might adapt our practices in English and Literature departments and larger university settings to take account of these changes. 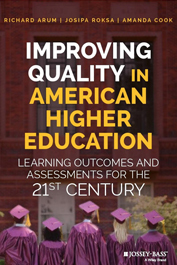 The report serves as a resource to the higher education community, highlighting strategies for assessing and improving student learning outcomes. It grows out of several years of work focused on increasing institutional capacity to assess student learning outcomes at MSIs. 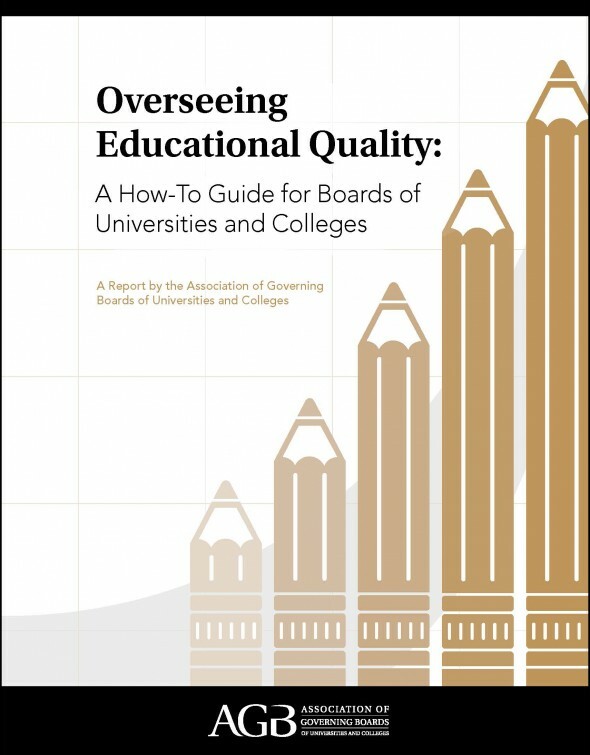 AGB—with support from the Teagle Foundation, an advisory committee, and teams from eight diverse institutions—has developed a set of tools and resources that can help college and university boards work more effectively with campus leaders and faculty to monitor the assessment and improvement of student learning and educational quality. Beyond the walls of our classrooms and the ever-growing classrooms without walls, such as online courses and Massive Open Online Courses (MOOCs), the best way to improve our society is to build the knowledge-base and critical thinking skills of ourselves and our next generation of the world’s citizens. How does writing change when we move online? 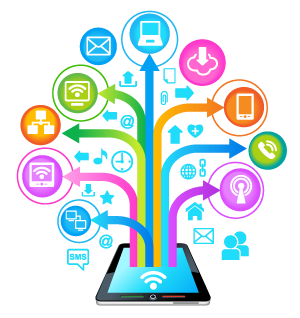 And how do we situate new technologies and their attendant forms of writing within the larger context of what it means to teach students how to communicate through the written word? Using qualitative research methods, quantitative research methods, and assessment strategies, teachers collect data about their own classrooms, as researchers collect data, to inform and improve their teaching and ultimately student learning. The GSI Teaching & Resource Center helps graduate students transition to teaching as GSIs at UC Berkeley and offers programs and services to assist graduate students in developing their teaching skills for future academic and nonacademic careers. 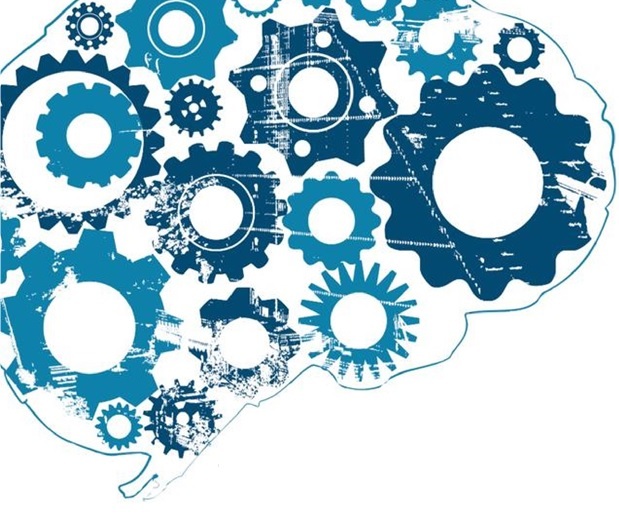 Two mathematicians study how they can improve quantitative reasoning skills in their students by comparing different approaches to implementing “performance tasks." 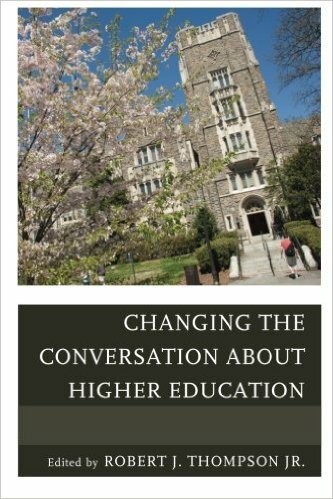 This book hopes to change the nature of the conversation about higher education from critiques to focusing on efforts of systematic improvement in undergraduate education. These summaries of research literature on learning and the application of research principles to undergraduate pedagogy seek to inform considerations of effective teaching and learning among faculty members of our GLCA member colleges. 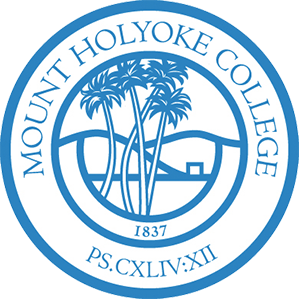 Three New England Catholic colleges collaborated to evaluate students' religious, spiritual, moral and ethical growth. The Periclean colleges and universities share a common commitment to what we term “High Engagement Learning”: intensive pedagogical techniques and faculty-student interaction involving extraordinary levels of attention and energy, whether inside or outside of the classroom. This report synthesizes the insights from nine individual case studies to discern promising practices in using information about student learning. 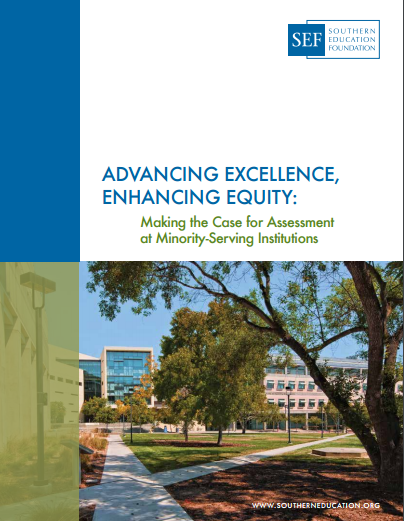 The report concludes with lessons learned and reflective questions to help institutions advance their own assessment efforts within their specific institutional contexts. The survey reports that capstone experiences typically lead to many of the benefits associated with undergraduate research experiences: development of skills in writing and oral communication, critical thinking, and research; an increased interest in research; an empowering sense of academic self-confidence and achievement; and development of project management skills. After testing the spatial visualization skills of undergraduate students in a variety of disciplines, the authors found that geology, fine arts, and physics students had the highest average spatial test scores even after controlling for gender and grade point average. 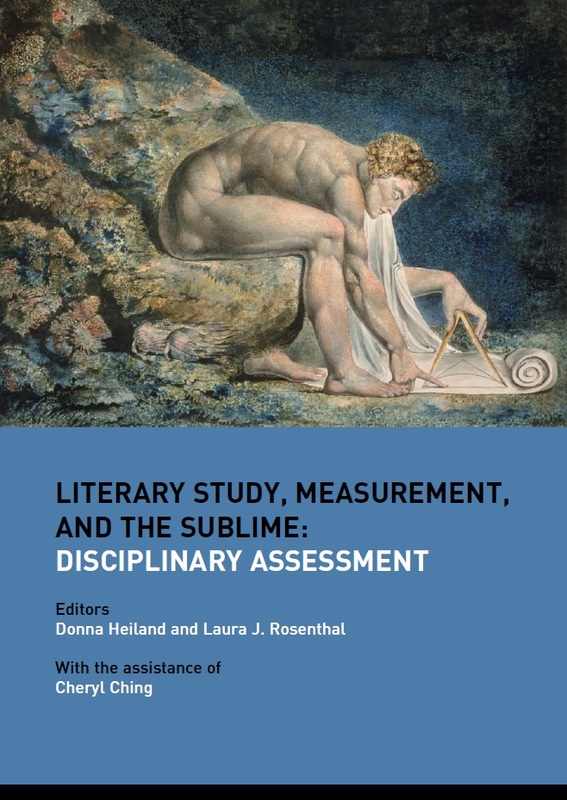 This collection of essays, edited by Donna Heiland and Laura J. Rosenthal, represents an enticing and interesting series of ideas and experiences about the work of assessment in literature and related fields that often resist the language and the methods of standard forms of assessment. 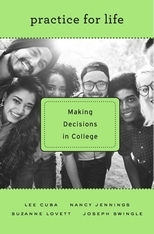 This report offers recommendations for instituting initiatives that allow sophomores to more successfully focus on their exploration of liberal learning at small colleges. It summarizes advising practices including advising as learning, advising in sophomore gatherings, sophomore courses, and faculty-student collaborative research. 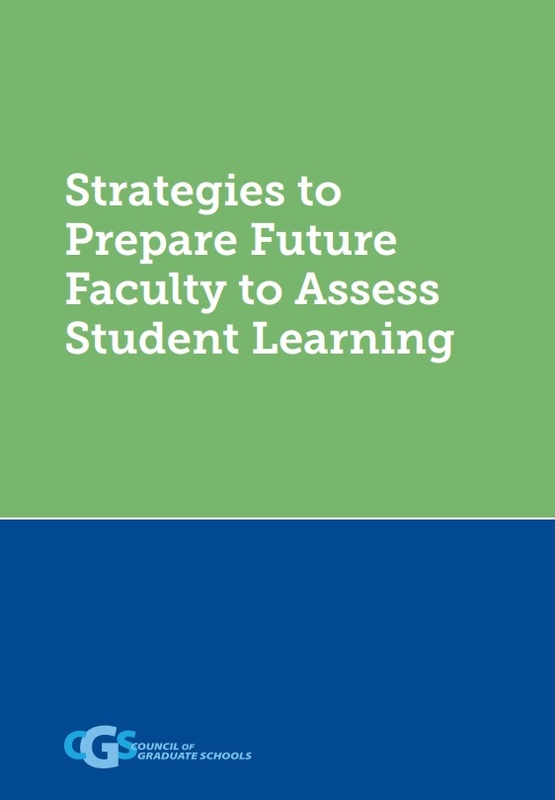 This report provides data and insights gleaned from assessment experts, graduate deans, and graduate students about opportunities to integrate preparation in learning assessment into professional development programs for graduate students. The GLCA Pathways to Learning Collegium has taught us how a comparatively modest amount of Foundation funding can foster a substantial community of interest in pursuing innovative approaches to pedagogy and comparing the impact of those approaches to more traditional styles of teaching. Liberal arts colleges want to provide the greatest academic opportunities to our students, and provide faculty with the tools necessary to present these opportunities in their undergraduate courses. SEPCHE investigated the extent to which learning factors are enhanced by altering instruction to incorporate active pathways to learning. ”Big Science at Small Colleges” centered on a grassroots model for faculty development in genomics education at liberal arts colleges with research active faculty. Working over a period of eighteen months, this group studied new ways of organizing English and language programs within the general parameters of a liberal arts education. The group also explored ways to strengthen majors in our fields and attract new generations of students to a traditional core of liberal study: language, literature, and culture. The GTU’s Preparing Future Faculty Project applied an alternative vocational development model over two semesters of work with teams of doctoral students and faculty mentors in order to consider factors which encouraged a central pedagogical and professional focus on “big questions” of meaning and value. Over the course of eighteen months, a project based at the Center for Hellenic Studies in Washington D.C. studied undergraduate programs in classics with the goal of developing a better sense of how a major in classics fit within the broader agenda of liberal education. At a time when leaders in higher education are increasingly asking students to engage the large issues of life’s meaning and to think critically and responsibly about their role in the world, religious studies offers unique opportunities. How does the study of history contribute to liberal learning as a basis for a lifelong engagement with ideas and civic culture? In this paper, we explore these alternative conceptions of liberal education in interaction with two significant factors: 1) shifting demographics and expectations in the college-going population, and 2) changes in the nature of work itself. This White Paper sketches out the many ways in which we have come to define and employ a pedagogy of belief and doubt in a variety of classroom experiences. This White Paper describes how four campuses with different Protestant histories developed conversations about their institutions’ secular boundaries. Paying attention to and beginning to analyze what makes this conversation difficult helps educators and students see the conversation’s promise—for student learning and civic life. The goal of this report is to consider the relationship between the goals and objectives of the economics major and goals and objectives of a liberal education. Is the economics major playing its part in meeting those objectives? This report describes important lessons that merged from the consortial experience as the member institutions charted into this new territory. 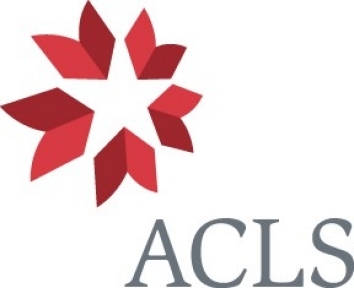 The primary purpose of this project has been to develop a set of instruments that will allow an empirical analysis of the impact of different program characteristics and types on liberal arts learning goals using assessment methods which include, but are not limited to, student satisfaction and self report. The Foundation’s grant allowed a Working Group of ASBMB members to assess how the recommended curriculum in biochemistry and molecular biology (BMB) is implemented at a range of institutions, and also provided an opportunity to consider the relationship of a hierarchical, interdisciplinary science major such as BMB to broad educational goals. 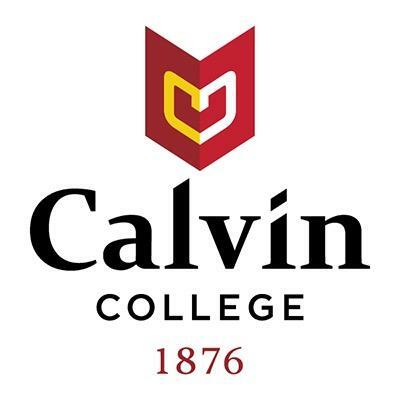 This paper describes research undertaken by Calvin College to explore the intersection of the liberal arts and the particulars of place. Mount Holyoke faculty, students, administrators and alumnae met to discuss three major areas: (1) how to entice all students to learn abroad; (2) how to expand summer and study abroad in a financially sustainable way; and (3) how better to integrate students’ learning abroad experiences into their educational pathways. Recent studies of college students' attitudes toward religion suggest that the academy is no longer the bastion of secularism it was once assumed to be. To help make sense of these changes, the SSRC offers this online guide, which was derived from a series of essays it commissioned from leading authorities in the field of religion and higher education. On the basis of existing evidence and our own observation, we contend that the teacher-scholar model of faculty professional activity brings important benefits to individual student learners, institutions where that model flourishes, and to society more broadly. Recent studies of college students' attitudes toward religion suggest that the academy is no longer the bastion of secularism it was once assumed to be. To help make sense of these changes, the SSRC commissioned the following series of essays from leading authorities in the field of religion and higher education. 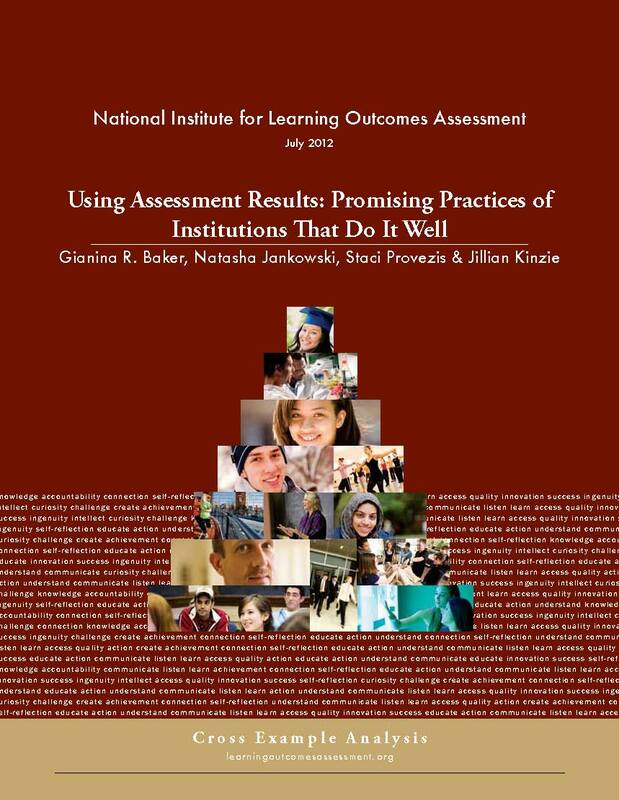 This report captures “work in progress”—both in terms of the sheer variety of the assessment projects and the many concerns on campus about the purposes and practices basic to assessing learning gains over time. In order to close racial and ethnic gaps in educational attainment, it is necessary to focus on closing gaps in both college enrollment, and college achievement and graduation. In this report, we focus on what colleges and universities can do to ensure that among the students they admit, achievement and graduation rates are comparable across racial and ethnic groups. 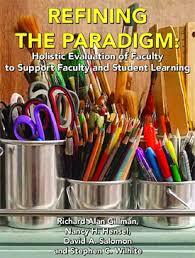 The open curriculum is based on a belief in the power of student choice exercised in collaboration with faculty. Such a curriculum gives students great freedom but expects considerable responsibility in return, and it requires significant faculty engagement to shape, support, and inspire student learning. 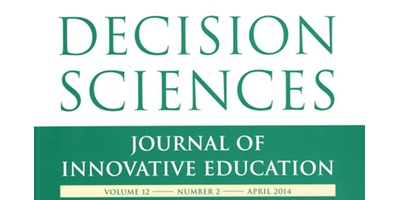 Together, the survey and interview data have been used to map the different ensembles of interdisciplinary education programs and assessment practices in liberal arts colleges and universities nationwide, to analyze differences in the meanings and mechanics between these various ensembles, and to explore possible assessment alternatives for the future. Coverage of higher education often seems to accept as an article of faith that college students learn what they set out to learn as long as they pass their courses and get degrees. The diploma seems to matter most to journalists and, frankly, to employers; it is treated as a proxy indicating that a graduate has absorbed a body of knowledge or mastered a set of usable skills. 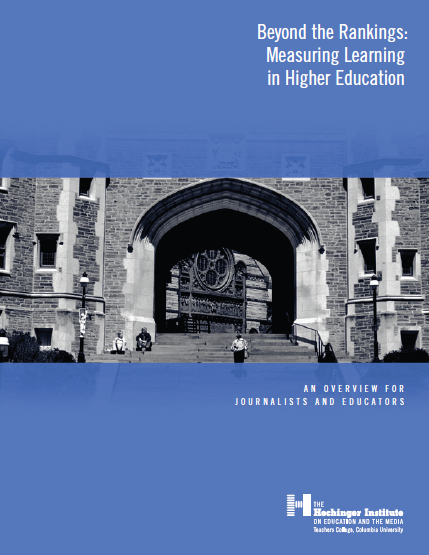 The paper that follows is a traditional White Paper in the sense that it outlines a theoretical understanding of ethnicity and offers strategies and recommendations for approaching the pedagogy of ethnicity in higher education.